Buy Blueborn HP 1200 - Hand pump air pump 1.2 liter volume from Blueborn at Camping Outdoor online. Availability: Dispatch in 24 hours. As a thank you, we will provide a 3% discount on your order when you select the “bank transfer” payment method during the purchasing process. For all further payment methods, “our price” is important for the invoice. Simple manual operation means that the pump is immediately ready for use and perfect for use away from all power sources. The piston pump has a fixed handle and practical footrests. The double stroke function generates an air flow during upward and downward movement. This means that the pump achieves the desired performance twice as fast as a conventional floor pump. The scope of delivery includes two different standard adapters. 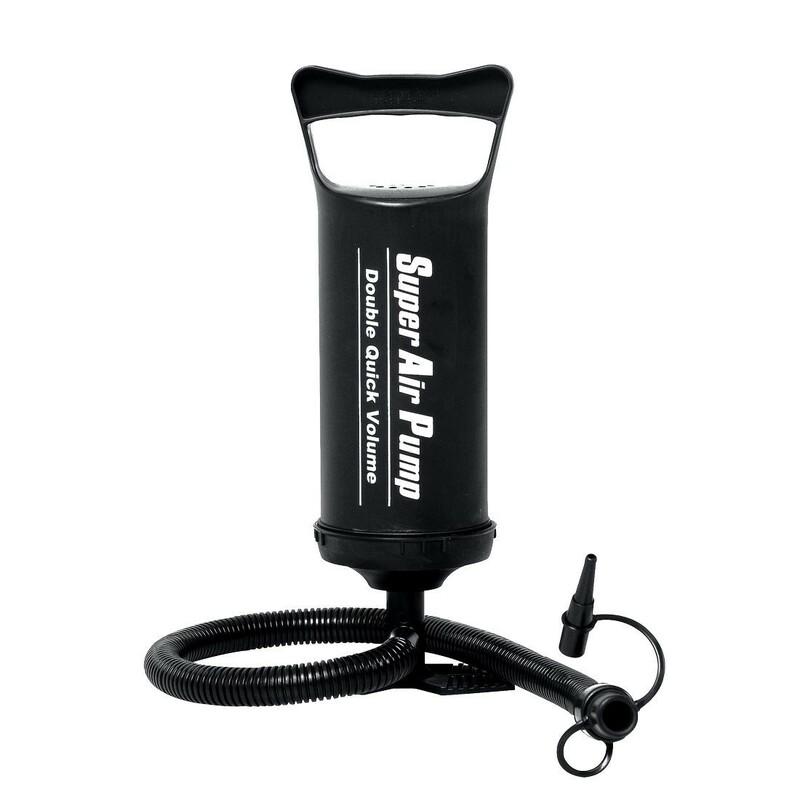 This makes you flexible and allows you to use the camping pump for various inflatable articles. In no time at all articles such as inflatable mounts, air mattresses, air beds, pools, paddling pools, toys, small boats or similar can be assembled without great effort. In addition, the pump accessories are supplemented by the attached air hose. The lightweight is easy to store and fits easily into any travel or beach bag. With a length of approx. 30 centimetres and a width/height of approx. 9 centimetres, the handy pump is a must for camping or leisure equipment. High-quality air pump for use far away from all power sources. Incl. adapter & hose for many occasions on holiday, on the camping site or at home when inflating a guest bed. The piston pump is made of durable ABS plastic. The capacity of the hand pump is 2 x 1200 cm³ per stroke and generates a maximum air pressure of 4 PSI (0.28 bar). Due to the dimensions of 36x9.7 cm and the weight of only 440 g, the pump can be easily transported. Thanks to the stable stand and the ergonomic handle, pumping is very comfortable. This compact air pump should be part of every excursion. Whether you want to inflate inflatable items such as air mattresses, pillows, pools, boats or water toys, this pump is always ready for use.